To that end, Saitou's team recreated the developmental process of human germ cells, which gives rise to reproductive sperm and eggs. 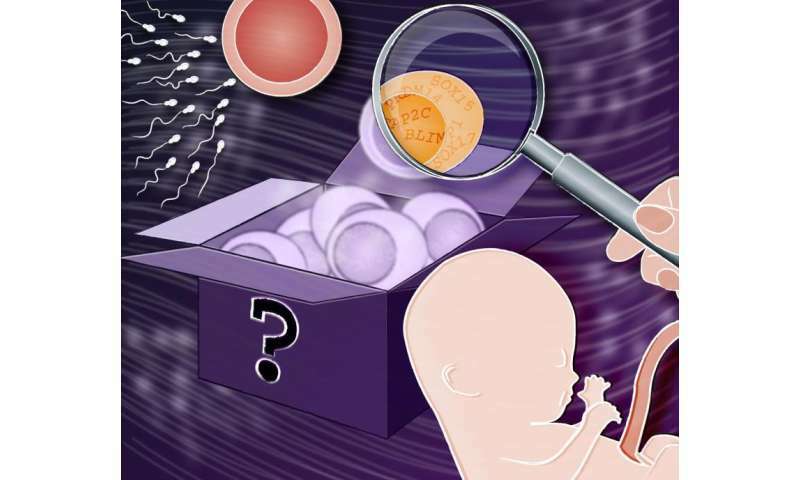 In addition to illustrating key transcription interactions and signaling events, the scientists gained insight into how epigenetic marks—traits that are inherited without changes to the DNA sequence—are "erased" at the beginning of germ cell development. Excerpt: "...the scientists gained insight into how epigenetic marks—traits that are inherited without changes to the DNA sequence—are "erased" at the beginning of germ cell development." http://www.biomed...4/14/666 The authors present evidence that argues that alternative splicing is used to alter protein phosphorylation, which can alter protein stability, subcellular localization, activity, and other properties . Cell type differentiation appears to be biophysically constrained by nutrient uptake and RNA-mediated protein folding chemistry that protects DNA from virus-driven genomic entropy in all cell types of all individuals of all living genera via conserved molecular mechanisms and fixation of amino acid substitutions that stabilize the organized genomes of species from microbes to man via their pheromone-controlled physiology of reproduction. Evolutionary theorists hate the fact that all of the above links the nutrient-dependent de novo creation of olfactory receptor genes to chromosomal rearrangements and all biodiversity without mention of mutations, natural selection (except for food) or evolution. Watch them down-rate my posts so that others will see only their pseudoscientific nonsense. Why does JVK get down-rated? Lies about the work of real scientists (He flunked out of college, worked as a lab tech). He sells a "perfume" based on pseudoscience. Uses word salads to hide is biological ignorance. Changes the topic when he is cornered. See also: Nutrient-dependent/pheromone-controlled adaptive evolution: a model. Editor's comment: "The 2013 review article by James Vaughn Kohl published in Socioaffective Neuroscience & Psychology and criticized in the above Letter to the Editor was subjected to standard peer review and the revised version was accepted by me after it had been accepted by both reviewers."